What do you get when you cross an eight-day winning streak with seemingly dovish comments from Federal Reserve Chairman Jerome Powell? How about some serious action in an exchange-traded fund stuffed with homebuilder stocks. Investors poured almost US$45 million into the US$674 million SPDR S&P Homebuilders ETF, or XHB, on Wednesday, the most this month. In addition, US$442 million worth of the fund’s shares traded, the highest volume since June and quadruple the daily average for the past year. The S&P Supercomposite Homebuilding Index posted eight straight days of gains through Wednesday, the longest winning streak since October 2017. Before the start of this rally, the benchmark was down more than 34 per cent for the year. 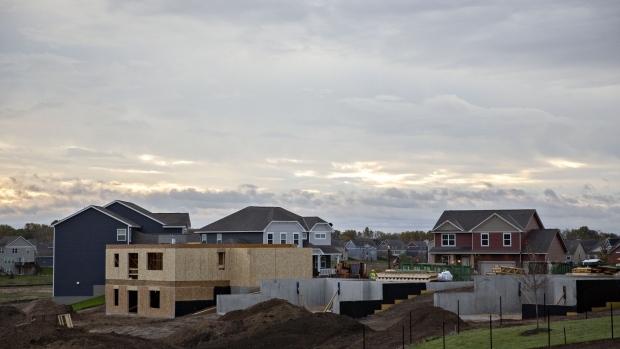 Housing stocks have become “washed-out” with a lot of bad news already priced into the group, Matt Maley, equity strategist at Miller Tabak + Co., wrote in a note to clients on Nov. 19. The builders have gotten crushed, with any related indexes or ETFs seeing virtually nothing but down-ticks every day from mid-September to mid-October. The non-stop bombardment of weak real estate data, from new home sales to housing starts, has also added pressure to the group. “Its oversold and over-hated condition, combined with its pretty good action in the face of very negative news over the past few weeks, tells us that the group is very ripe for a tradable rally,” Maley said. Pending U.S. home sales unexpectedly fell in October by the most since January and reached the lowest level since mid-2014, as evidence mounts that the housing market is struggling. Sales of new homes also slid to the weakest pace since March 2016. Rising borrowing costs and higher prices have kept many buyers out of the market. But dovish comments from the Fed chairman on Wednesday may have shone a ray of sunshine on the group. Powell said interest rates are “just below” a range of estimates of the so-called neutral level, possibly suggesting fewer rate hikes next year.